Adorn a garden wall with timeless style using these Panacea Black Large Lattice Trellises. Placing a trellis in your landscaping provides plants support as they grow upward, and this set of 5 pieces is fantastic for use all along your fence. A generous, diamond shaped lattice forms the interior of each unit, creating a wealth of gripping spots for tendrils. The bottom of this lattice has a gentle, upward arch, and two dramatic curves at the top culminate in scrolls and a fleur-de-lis finial for a striking look. The 6.5" long legs of each trellis insert into soil, while two tabs near the top have screw holes, for affixing the structures to a wall. A plastic coating on each unit keeps them protected from the elements, while the metal core forms hardy supports. Their black hue enhances the classic look, and the package is fantastic for dotting several garden walls. Provide support for several plants elegantly with these Black Large Lattice Trellises. 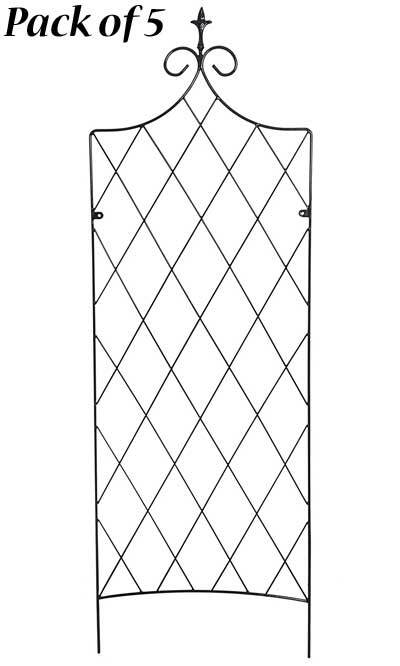 Note: This case pack contains 5 of the Panacea Large Lattice Trellises, Black, 71"H each.